Wriphe isn't about finding yourself. Wriphe is about creating yourself. 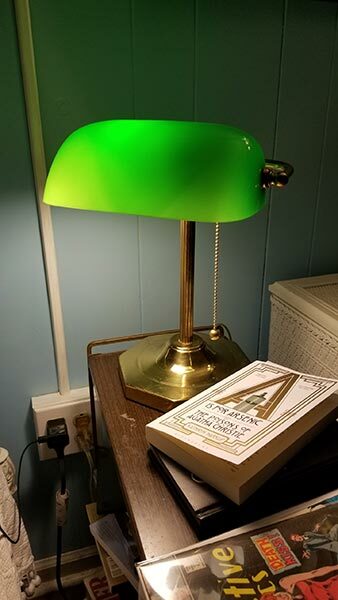 This counts as news only to me, but I fixed my bedside lamp. The switch had worn out. It's no antique, though it's no spring chicken, either. I "inherited" it when my college roommate graduated and moved to the west coast. (Hi, Jason!) That was only... fifteen years ago. I don't know how old it was then. (Can you shed any light on that subject, Jason?) If I've yanked that chain twice a day ever since, that's somewhere in the neighborhood of approximately 11,000 pulls. Maybe I should have been counting. Anyway, thanks to a replacement switch found on eBay, I can now read in bed again. Sweet dreams, everyone. If you had three pointless rants and I gave you seven more, how many would you have? Afterwards, if I gave you ten more pointless rants, how many would you end up with? I woke up to a text from Friend Ken who needed advice regarding his broken range top. "Boy, am I glad I don't have his problems," I thought to myself. And then my kitchen sink broke. Somehow, the nut holding the pipe on the strainer basket in the left basin had become completely stripped. 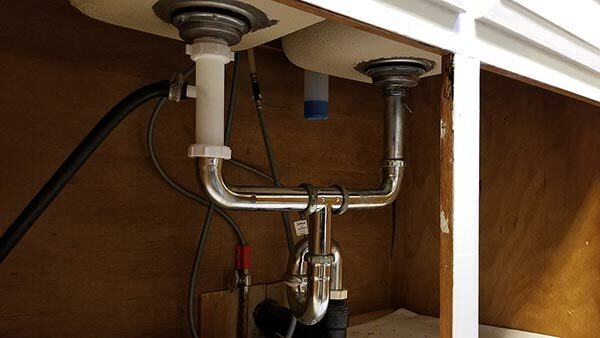 As a result, the pipe slid sideways, and the dishwater, instead of draining away to the septic tank, drained into the cabinet. Mom and I debated calling a plumber, but we ultimately agreed that replacing a sink basket is no big deal. I should be able to handle that repair easily. Unless the locknut nut is rusted in place. Which, of course, this was. Enter the hacksaw! In a tiny cramped space! On my back! Two hours, one trip to Home Depot, and $17 later, the sink was back together and successfully holding its water. That's when I noticed that the pipe in the right basin had a cracked nut that was also leaking. Grr. Fortunately, I had the replacement parts leftover from a previous repair to the basement sink. 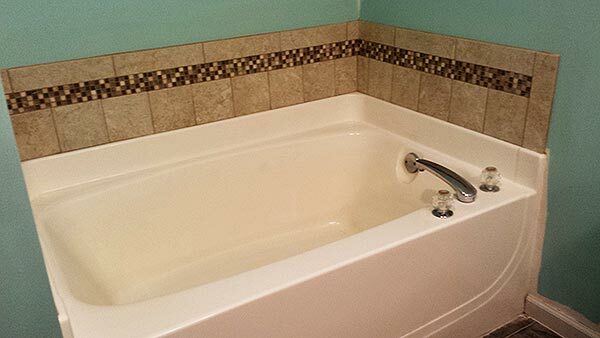 So another hour later (in a tiny cramped space, on my back), both sides of the sink were good as new! Almost. On reinspection, the left basin was leaking again. Thinking it must be because I had used too small a bead of plumbers putty, I unscrewed everything again. That's when I noticed that while reassembling the parts last time, I had accidentally placed the high-tech piece of cardboard (meant to reduce friction between locknut and gasket) above the rubber gasket instead of below it. It turns out that cardboard is terrible at holding water. Who knew? Maybe I *should* have called a plumber. Anyway, everything is working as it is supposed to again. So take that, Ken! The ball is back in your court, buddy. Now hang on, I fixed my problem too! On my own, mind you, with no advice received. Although it wasn't nearly as involved as yours turned out to be. I'm still not sure how the nut holding the basket in the basin got stripped. Anyway, I'm calling a moratorium on all kitchen-related incidents for the foreseeable future. If you had three advertisements and I gave you seven more, how many would you have? Afterwards, if I gave you nine more advertisements, how many would you end up with? On the afternoon of Wednesday, May 16, lightning struck a tree behind our house. Though the strike was indirect and didn't hit our power lines, several electronic components were still damaged. It killed our Tivo, broke our TV's HDMI processor, and, most importantly for the purpose of this blog post, fried my elliptical. The elliptical console would no longer power on. A quick test with a lamp proved that the power outlet still worked. My trusty voltage detector told me that the elliptical power supply was still functioning, but the console just would not respond. So I did what anyone would do: I bought a new console. That was easier said than done. My Schwinn 430 is a discontinued model, so parts aren't exactly easy to find. I did eventually find a retailer online with a new console in stock, and the part arrived a week later. Only it wasn't exactly identical to mine — meaning it was an updated redesign used by more modern models. It also didn't work. To be clear, the power supply doesn't plug directly into the console. It plugs into a round hole at the base of the elliptical, and power is passed through a sensor array and then transfers to the console motherboard via a 8-pin connector cable. Therefore, I couldn't tell if the problem was that the new console was incompatible or some other problem. At this point did I do what I should have done earlier and tested the cables inside the elliptical's sealed wheel shroud. That required quite a bit of deconstruction. I took apart the arms and the treads and the mast only to be stymied by the crank arms. To remove the crank arms required a crank puller, a bicycle tool. I didn't have a crank puller. So to continue my disassembly, I had to order one of those. While I was at it, I decided to order a new power supply from the same source to save on shipping. The crank arrived in three days, and it was perfect for the job. But before I took the cranks off, I decided to test the power supply. Surprise, surprise, plugging that into the system made made it all work again! Both the old and new consoles worked fine. The replacement console cost me $240. The crank puller was $12, and the new power supply was $10. I spent far more than was necessary when it was the cheapest part that needed replacing. The worst part is that I'm sure I didn't learn anything from the entire experience. Epilogue to this story is that when I finally got everything put back together and working again and started my first workout in nearly a month, the power to the house went out. If there is a God, he's got a sick sense of humor. If you had four bottles of beer on the wall and I gave you eight more, how many would you have? Afterwards, if I gave you eight more bottles of beer on the wall, how many would you end up with? 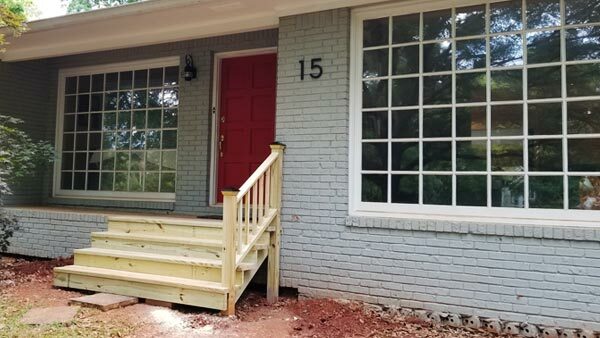 This is what I spent my May building: new stairs for the front porch! Not bad for someone whose best tool is a keyboard, if I do say so myself. If you had ten comics and I took away four, how many would you have? Afterwards, if I gave you three more comics, how many would you end up with? 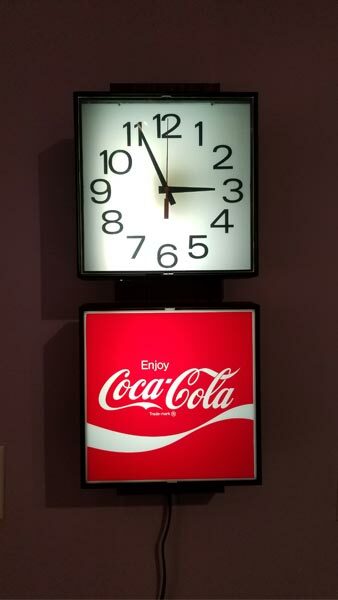 In 2003, my grandfather gifted me a backlit 1975 Ingress-Plastene Coca-Cola clock (Model G017) that he had been storing in his garage. The light still worked, but the timekeeping didn't. I took it apart and tinkered with it a bit, but for reasons I couldn't recall, I never got around to finishing the repair and the clock was put, in pieces, into storage in my garage. Like grandfather, like grandson. In April, looking for something to do between programming jobs, I finally decided to finish my decade-old clock restoration project. Having forgotten why it wasn't working, I started over at the beginning. I spent $20 on assorted parts to replace the missing winding mechanism before I re-discovered that the original motorized movement was worn out. Then I remembered why I didn't fix it 10 years ago: the company that made the electric motor stopped making clock parts in the 90s. Unwilling to give up a second time, I took to the Internet. Replacement Lux series 2350 movements are available periodically on eBay for prices as low as $25. In fact, the whole clock is common enough enough that I could buy a replacement between $50 and $250, depending on condition. But I didn't really want a replacement; I wanted the clock that my grandfather once owned to tick once again. 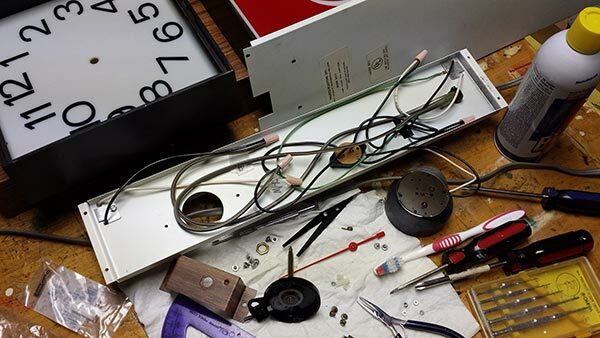 Besides, I couldn't really trust 40-year-old parts to keep working any longer than they had in my clock. So I went ahead and spent $40 on a new electric movement — Made in the USA™ — with a set of hands that mimicked what I had. (The original had a sweeping second hand and the replacement steps, but beggers cannot be choosers.) It took a bit of tinkering with a drill and a vice to make the new, shallower movement fit with the original florescent lamp interior, but it worked out well enough in the end. After nearly 15 years, I finally have a working grandfather clock. Now my mud room looks like a little league snack bar, and that's just the way I like it. This...is awesome. I remember these clocks quite well. If you had six toys and I took away six, how many would you have? Afterwards, if I gave you three more toys, how many would you end up with? It took a lot longer than I would have thought (rough-hewn cedar swallows paint by the gallon), but I have to say I'm very satisfied with the finished product. 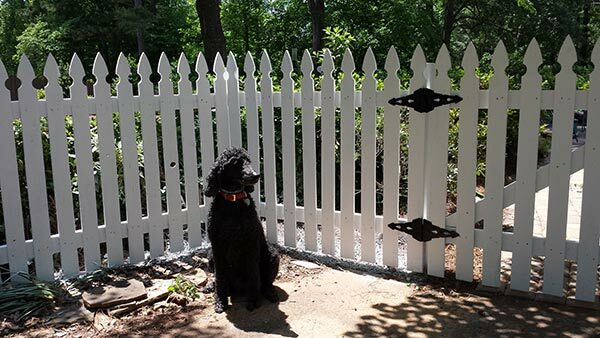 I must admit, something about a white picket fence says "American Dream" to me. If this is what Trump's wall looks like, I think I'll be okay with it. If you had four poodles and I gave you four more, how many would you have? Afterwards, if I gave you eight more poodles, how many would you end up with? Disclaimer: I did not choose that color. I never met the person who chose that color. I'm terrified of the person who would choose that color. If it was up to Mom, the walls would be beige. Or tan. Or eggshell. Or ecru. Mom loves her neutrals. If it was up to Dad, the walls would be white. 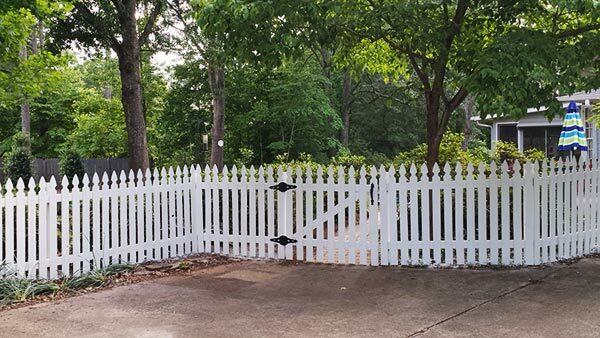 Dad, a former real estate agent, would paints all walls white. It's almost a mania. If I can ever make up my mind and paint the room, I'll provide pictures. In the meantime, don't hold your breath. If you had two blog posts and I gave you four more, how many would you have? Afterwards, if I gave you six more blog posts, how many would you end up with? Tired of throwing away blue jeans when the seat ripped, I finally decided to learn to use a sewing machine. Unfortunately, my pants were so bad, they killed our machine. Rather than go without, Mom spent an ungodly amount of money on a new electronic machine that's smarter than our television. 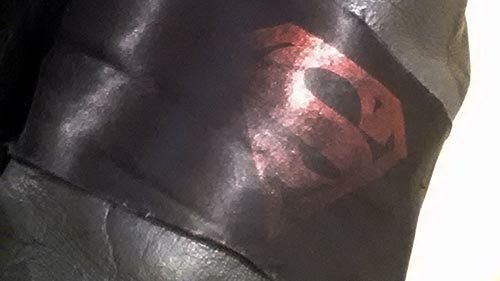 With my pants now fixed, it's time to turn my attention to my 20-year-old leather jacket. 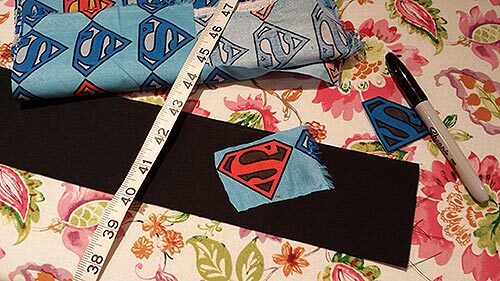 Rather than track down and unbag another copy of a 20th century comic book — I refuse to admit how many times I've already done this — I decided to make my own from superior materials and a 21st century sewing machine. 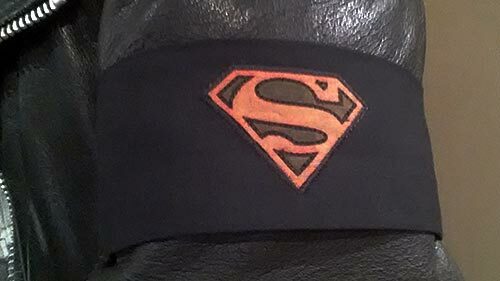 I got lucky that Jo-Ann's had Superman pajama fabric on sale. I was planning on having to cut my own "S" shield. The finished product turned out pretty good, considering that the first time I'd ever used a sewing machine was two weeks ago. Now I'm ready for a bigger project: repairing the jacket pockets. I look forward to being able to carry pocket change again. If you had six movies and I gave you eight more, how many would you have? Afterwards, if I gave you eight more movies, how many would you end up with? 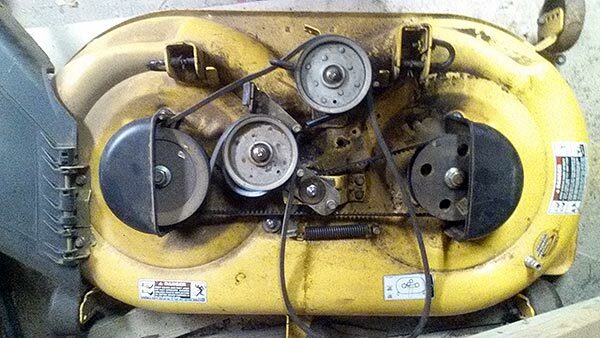 I have a Cub Cadet LX1040, and I have to say that its Kohler motor has been a truly unstoppable beast. However, I can't say the same about the cutting deck. It's been... temperamental. The mower has been in the shop for 4 of the past 11 months, and when it broke again last week, I decided that it was time I learned a thing or two about lawn mower repair. Quite frankly, there's nothing complicated about the mower deck. Just some pulleys and springs that adjust the tension on the timing and PTO ("power take-off") belts. The biggest problem in repairing one is figuring the anchor points for everything, which would be easy if you'd ever seen one in full working order. But who takes the deck off a new lawnmower? Next time I buy one, I will. I have to give full credit to Cub Cadet customer service. After I determined that my latest problem was a bearing failure that required a new pulley, their website helped me find and order the replacement part with little trouble. I had the part in less than a week and operating a day later. So how come every time I take my mower to the shop, it's there for at least a month? So that was my day: repairing a mower, cutting the lawn, then going inside and making Rice Krispies treats before sitting down to watch some football. That's a manly enough day for anyone. If you had ten DC Comics and I took away ten, how many would you have? Afterwards, if I gave you eight more DC Comics, how many would you end up with? Anyway, it's been a busy month, so I'm taking a few days off from diy projects before I start on painting the garage Twilight Gray, Quartz Stone, and Firecracker Red. Painting won't be so much trouble, but before I can begin that, I have to move everything out of the garage. Then at some point I'll have to move it all back in.... And that can all just wait a few days. If you had three pointless rants and I gave you four more, how many would you have? Afterwards, if I gave you eight more pointless rants, how many would you end up with?